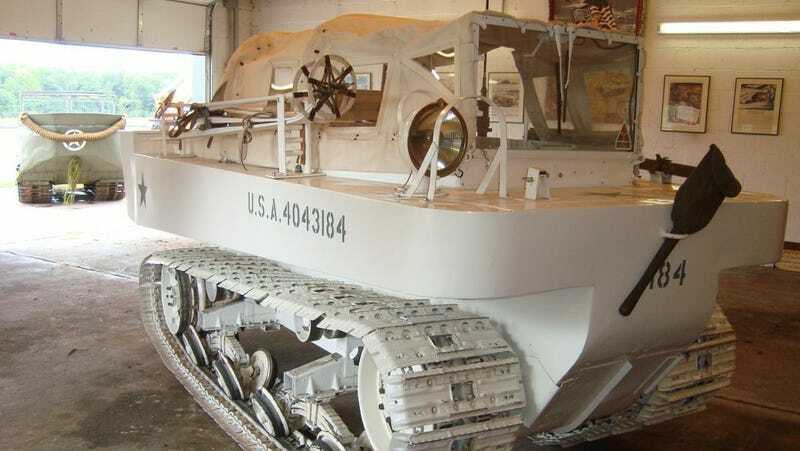 You can find some wild stuff for sale on the Internet, but it can be pretty rare to find old war prototype vehicles out there for, y’know, specifically traversing the snow. But it is most definitely the case with the Studebaker T-15 Snow Weasel. For some reason, this thing looks like it belongs in Star Wars to me. This straight-up would not look out of place on Hoth. Apparently, though, it was actually used for commando operations in Norway by the US military in WWII. One of these bad boys ended up on eBay about six years ago—and no one was smart enough to buy it. I mean, it is probably not the most practical vehicle. But it blows my mind that someone out there wasn’t willing to scoop this thing up. The initial M29 Weasel was built by Studebaker and wasn’t outfitted in the white paint scheme. It was just standard military green—that came later, when they realized it might be helpful to, y’know, not be seen. Especially when you’re heading out to Norway to make sure Germany isn’t installing any atomic weapons. With a Studebaker Model 6-170 Champion 6-cylinder engine located in the back and the driver in the front, this bad boy had an operating range of a mere 165 miles at 36 mph—but it was enough. They didn’t necessarily need to be fast so much as they did strong, and they served that purpose well. They had fifteen inch rubber band style tracks, which mean that the tracks are made of a flexible surface like rubber instead of interlocking metal. This bad boy was initially intended to be amphibious, and it kind of was—but it wasn’t able to ford much more than a few inches of water before it got bogged down. Weasels were used all over the world, including Britain, France, and Canada—but none of the T-15 winter prototypes. I have a lot of unanswered questions as to how this ended up on eBay in 2011, which I imagine are just going to continue to be mysterious. This thing’s starting bid was one single cent. One single cent! And no one tried to bid on it! Who had this thing laying around to be able to sell it? What exactly were they expecting? And with all those wintry accoutrements? It’s a freakin’ steal. The Snow Weasel is barely bigger than a big car today. Can you imagine the possibilities? I’d never leave the house in the winter without it again.